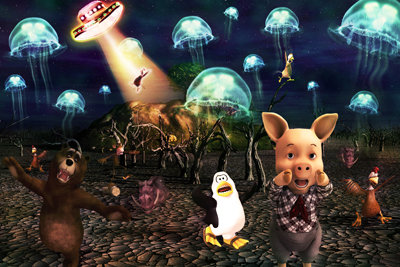 Today, photo manipulation is widely accepted as an art-form. Photo manipulation includes combining images, creating collages, adding artistic and painterly effects to photos and pictures, removing an object from its background, cloning, reproducing photographic effects, colorizing, and more. I personally LOVE photo manipulation because I can transform ordinary photos into something alluring, unexpected and totally out of the box. Get a background image. Then place all the animals on the right and into the appropriate position that you want. Open a Group Folder and name it Animal. This is to avoid messy layers. Now select the torch light head area as the UFO. Then Transform and warp it into an “ UFO” shape. Turn the background from day time to night. Create a new blank layer and fill in with dark blue color, call it Sky (make sure the Sky layer is under the UFO and Animal layers, so that it only work on the background). Change the Blending Modes to Linear Burn. Reduce the Opacity to 90%. Next, erase the unwanted part that affected the ground by applying mask. We need to darken the ground as well. This time we just adjust the Adjustment Layers – Curve. Change the color of the ground too. Place the Jellyfish into the background. We can play around with the sizes and also adjust the different directions. Next, change their Blending Modes to Screen so that we can erase the unwanted background easily. After that we put all the jellyfish layers under Group Folder – Jelly. Then merge down the layer with Control+E or right click the layer – Merge Down. Next, create another light source that comes out from the UFO. Create a blank layer, name it Light. Draw a rough triangle shape and fill in yellow. Later apply Gaussian Blur – Radius : 40 pixels to soften the border. Next apply Motion Blur – Angel : -55 and Distance : 450 pixels, so that we can get the area where you would like the ray of light to zoom out from. Now that we have our ray of light created, apply masking to re-shape the ray. Just brush the border with different Brush Opacity. Create a new blank layer, name it as Star. Fill in black. Go to Filter – Noise – Add Noise : Amount 180%. Right click the Brightness/Contrast layer, and create clipping mask. You will see a small arrow on the left pointing down at the “Star” layer below it. This is to tell us that the layer is being “clipped” by the layer below it , which means that it’s only affecting the “Star” layer. Then change the Blending Mode of Star Layer to Screen so that the sky can be seen in blue instead of black. Apply layer mask for Star Layer. Erase unwanted “stars” or white dot that affected the ground as well as Jellyfish. Duplicate Jelly Group Folder as well as Animals Group Folder. Then right click and Merge Group. You will get 2 individual layers which are Jelly and Animals. Now we can adjust these 2 layers easily. Hide the Jelly Group and Animals Group as our back up layers. Apply Adjustments Layer – Curve. After applying, press Ctrl + Backspace to inverse the masking and Brush (B) the areas that you want it to be shaded. Now we create shadows for the animals. Use – Adjustment Layers – Curve. But this time we place the shadow layer on top of the Background Layers. After that, Ctrl + backspace to inverse the masking and Brush (B) the shape of the shadow of the animals. However, I need to touch up the edges of the subject to blend into the background layer for a more realistic look. Apply Blur Tool ( R ) and soften the edges of the animals as well as the areas that you want it to look blur. Apply Adjustment Layer – Curve on the UFO Layer. You are free to select any colors and create Clipping Mask. Create a blank layer below the UFO layer, name it as Ray. Brush around the UFO. Apply Gaussian Blur to it. After that, Merge Down the Layers. Next I want to enhance the UFO with more lights. Create a blank layer, Brush Tool ( B) with lowest Brush Hardness and start to paint dots around the UFO. Now, to enhance the Jellyfish. Create blank layer, select green color and paint some lines. Use Smudge Tool ( R ) to curl the Jellyfish tentacles. At last we adjust the color to enhance the mood. Always use Adjustment Layers to adjust the colors so that we can always edit or amend the effects again. Arrange all those layers into “ Color Group” to avoid messy layers.